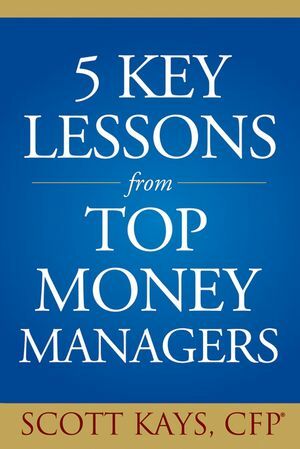 In Five Key Lessons from Top Money Managers, Scott Kays taps into the investment knowledge of five of the nation's foremost money managers-Bill Nygren, Andy Stephens, Christopher Davis, Bill Fries, and John Calamos. Through extensive interviews with these investment experts, Kays found five principles that are common to all of them. This book discusses each of these five principles in detail-and gives readers specific tools to implement what they've learned by developing a step-by-step process that incorporates all five principles. Kays even teaches readers how to screen for companies that meet the criteria for quality businesses and then analyze three of the qualifying firms to determine if they sell above or below their fair market value. SCOTT KAYS, CFP, founded Kays Financial Advisory Corporation in 1985, an Atlanta-based money management firm now with over $100 million in client assets. He has written numerous magazine articles and presented financial seminars for major corporations, including IBM, AT&T, and BellSouth. He has been quoted in the New York Times, Washington Post, Investor's Business Daily, Bloomberg Wealth Manager, Journal of Financial Planning, and Money magazine. Kays earned a BS in industrial management from the Georgia Institute of Technology. He is also a member of Mensa (the international high-IQ society), Gamma Beta Phi National Honorary Fraternity, and the Financial Planning Association.